Whenever we post an update to our favourite social network, whenever we fire off a text message across the miles, whenever we download an app in a matter of seconds, there are people who’ve made it possible that we rarely (if ever) think about. These people are the ones who go to great lengths to keep our digital life as seamless and convenient as possible. And these great lengths are often just as dangerous as they are great. With the digital landscape in a constant state of flux, the opportunity for danger is omnipresent. Consider the following: Foxconn makes news on a regular basis due to the strict working conditions placed on its employees. Just recently, rumours surfaced that thousands of factory workers on the iPhone 5 production lines went on strike. According to a story at CNNMoney.com, things even got physical between workers and inspectors during the impromptu work stoppage on Friday. Foxconn is one of the companies that is the subject of the film “Death by China”. The film focuses on what impact China is having on the United States in particular, but it does dive into the working conditions that many Chinese workers face on a daily basis. And the result of these conditions does have an impact on Americans living on American soil, through the lack of regulations involved when dealing with pollution, for example. While we are worried about the iPhone 5 casing being easily damaged, or even lower quality control standards being witnessed as customers open the boxes to marvel at the newest Apple product, the workers at Foxconn are paying a much higher price in their efforts to meet what an article at The Guardian describes as “indentations standards of 0.02mm and demands related to scratches on frames and back covers”. That said, Reuters reports that Foxconn has denied any strike action took place. So there’s that. Keep in mind that Foxconn doesn’t just work on Apple products – which tend to be the focus of most news stories coming out of the factory these days. They are also involved in the production of Microsoft’s Xbox 360 system, and in another report from The Guardian, workers threatened a mass suicide this year over a pay dispute. Getting away from Foxconn, one of the deadliest jobs in technology has been a job that has evolved over time, yet the danger remains: maintaining cell towers by free-climbing thousands of feet high. Installing any sort of cabling at a lengthy height has always had its risks. In fact, installing power lines is still rated one of the top ten most dangerous jobs in America, according to the findings by Business Insider. 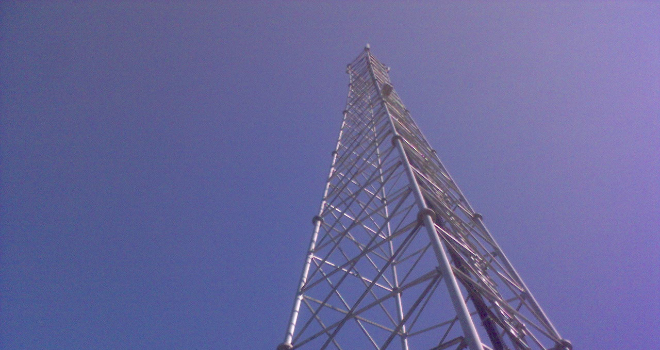 Installing and repairing power lines can happen close to the ground and at elevated heights, but almost all of the 3G, 4G, and LTE expansion in recent years has required climbing to great heights to keep towers running when they need repair. PC World reports that “there are a quarter of a million communications towers” – and that number is rising with the advent of these new (and faster) ways to communicate wirelessly. So while the risks don’t decrease, the number of those taking on the risks will. You should be able to get a sense of the dangers of “free-climbing” cell towers by watching the video below, which highlights all of the precautions — and risks — that these workers deal with to make sure your coverage is at its best. Watch all 7+ minutes — it breaks down every aspect of a standard cell tower climb. It’s pretty crazy. The Communications Workers of America aren’t necessarily focused entirely on job safety, either. While it is just one of the issues that they are working towards improving, they also don’t want to see technology suffer for the sake of safety. They have even gone so far as to create a website called Speed Matters, which serves to promote high-speed access to the Internet for all American citizens. The union bills itself as a “union for The Information Age”, and striking a balance between access and excess when it comes to risk is something they are working towards. Physical safety of those who allow signals to travel faster than ever before is just one aspect of a risky business. Moderating the content of what makes it into the online world is just as important. We all know that algorithms have holes in them and robots can only parse out so much, so the need for living, breathing, human beings to monitor what goes online to ensure that any inappropriate content doesn’t make its way onto a service is real. That’s where Internet content moderators come into the picture. This position is becoming increasingly important as social media and crowdsourced content becomes more prevalent. A quick search over at Simply Hired revealed 60 openings for this title, including some at Sears, Disney, Electronic Arts, and even Google. So while this type of service isn’t new, it can keep the people within an organization at arms’ length when it comes to content that can be problematic – or even disturbing – to deal with. Outsourcing it is one way of mitigating that risk. While researching this story, I also found this Joy of Tech comic that poked fun at some of the dangers that can befall those who work at Google. I thought it was very funny, until I discovered this piece over at BuzzFeed that told the story of a former Google contractor who was exposed to some of the most horrific things on the Internet with the promise that he’d be brought on full time. Not only did that not happen, but Google only paid for one instance of psychological assistance after a full year of being exposed to all of that “sensitive content” (as a Google recruiter called it). One software-as-a-service that does its best to prevent workers from getting adversely affected by monitoring the goings-on revolving the company is HootSuite. Dave Olson, HootSuite’s Vice President of Community explains that “the workload is distributed and everyone supports one another – practically and emotionally”. But there are times when the users get under the skin of those trying to bring the best service possible to them. That’s when Olson steps in. A little over a year ago, portions of our street were lined with police cars – with lights flashing – as they worked alongside crews that were going into the underground grates near our house. My wife and I weren’t sure what the deal was, so I took to the Twittersphere and connected with my local police department’s handle, asking them what was going on. It turns out that they were investigating the theft of copper – and I’m not talking about a small amount. I’m talking about lines of copper that covered several blocks. Copper theft involves illegally removing copper wire from power stations, public transport facilities, building sites, and other locations, and then selling the stolen metal as scrap. And while unlawful removal of copper may be dangerous for those who dare to try (especially since they are likely doing so under the least safe of circumstances), it is also dangerous for those who try to dispose of it in just as unsafe a manner. Unregulated e-waste disposal is a problem because of the fact it isn’t regulated – meaning safety isn’t a real concern. Often it’s developing countries that are sent older technology from the industrialized world that wind up bearing the brunt of the danger because of the measures they take to scrape value from the materials that lie within these devices. Below is a short piece by Greenpeace that illustrates the harm that computer recycling in India is inflicting on workers’ health. A disturbing video, it underlines why recycling needs to be carefully regulated. The aforementioned PC World article goes on to report that the U.S. doesn’t necessarily keep track of what they call “spent electronics”, and if users want to keep the disposal of their old technology on the up-and-up that they should do their homework and use a reputable e-waste recycler. When we go out and buy our shiny new tech gear, those behind the making of it rarely come across our minds. The same applies for those who help make sure it works when called upon, such as those who create situations that allow us to transmit signals across the miles. And to think about it for a prolonged period of time might just change your mind about such a purchase. It’s not likely, but it might. I’m certainly not asking you to do that. If you do, that’s fine. But it’s not the idea behind this piece.The idea is to understand that while we can fit so much more in the palm of our hand or in a carry-on bag than ever before, we really should be grateful for every single person and organization that makes it so. From the designers and developers…all the way to those on the front lines.